Name of Pathogens Cercospora musae Zimm. Hosts: Musa sapientum, M. paradisiaca, M. fehi, M. cavendishii. M.
Plaoe oforigini Java, so far as known. 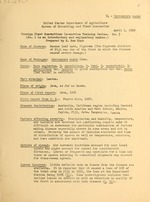 First report from U. S.t Puerto Rico, 1938.
and host condition are important. the fruit is associated with this disease (L, 14). as a treatment and is applied as many as 18 times per year. that any special restrictions to protect them would be required. quarantine measures already in force. infection to the first sporulation. not show until the next pair of leaves has had time to open. celled and nearly oblong instead of tapering or slightly curved. Spores may remain viable for several weeks. period of three or four days of moisture seems to be required. Bibliographys Only a few of the articles consulted are listed. 1937 Leaf spot disease of bananas. Journ. Jamaica Agrio. Soo. has been present in a mild form for a long time. dust is about 2 shillings per acre. (2) British West Indies Fruit and Vegetable Council. Agriculture, Trinidad, February, 1938. 61 pp* Gov't Print. discussed possible new vars. of banana. (3) Cheesman, E. E. and Wardlaw, C. W.
leaf spot. Trop. Agric., Trinidad. I4 335-336. 1937.
the oldest leaf showing spotting. Agrio. Journ. 30: 455-457. 1928. 1938 In a letter dated Spt. 12, 1938, and addressed to B. R.
1958 El control de la 'Sigatoka' del Banano. Bol. Coop. Banan. Magdalena Lim., Colombia, 1938, 7-8 pp. 7-19, 14 figs., 1938. (7) Parham, B. E. V.
Plant Path. Queensland. Pamphlet No. 6, pp. 5-22. Jan., 1933. Dusting and stripping as tried were ineffective. the spores kept 8 weeks (Aug. 8 to Oct. 5) germinated. the surface of the spots following prolonged rainy weather. February, March, and April cause an epidemic outbreak. Defoliation in worst when growth is slowest. 1936 SiGatoka Leaf Disease of Banana. British Honduras Dept. Agr. Leaflet 31 1-7. 1936.
spray residue from the fruit. production was considerably reduced on a number of plantations. most rapid and lush growth." (12) Smith, F. E. V.
distributed by air currents induced by burning. 1937 Notes on Ceroospora Leaf Spot of Bananas (Cercospora musae). appeared above stimatal pores on the lower surface of leaves. during the 20 day period of parasitism also. x 3-5 mu and with 4 to 6 septa. 1933 Ann. Rept. Agric. Officer, 1932. Dept. Agri. Fiji, Ann. Bull. Div. Repts. 1932. 19533. 1958 Cercospora leaf spot of bananas. Journ. Jamaica Agric. Soc. L2: 25-3h. 1958. also published as Bull. 15, Dep. Sci. Agric. Jamaica. (Abstr. in R.A.M. 17: 475-4-. 1938). Disease bad on new land that produces poor bananas anyway. 1935 Diseases of the banana and of the Manila hemp. X + 615 pp. 2 col. pl., 280 figs. London. musae) is found on pages 285, 286, 291, 292, 2953, 515.
being mostly associated with old trash." II, Centralblatt fur Bact., II, Bd. VIII, p. 219, 1902. Stahel in Tropioal Agriculture 14. 257-264. Plates I and II. Hemp Plant, page 290. 1935.